Have you noticed that nobody sprints anymore? It’s a real shame, because throwing just a handful of sprints into your weekly training can give you an edge – even if you don’t compete. My hunch is that sprints gradually disappeared from most amateur athletes’ training programs for three primary reasons. Power meters made it clear that 8-20 minute efforts resulted in significant improvements in power at lactate threshold and shorter 1-3 minute high-power efforts produced big improvements in power at VO2 max. This led to a shift in training plan development that emphasized these two energy systems to the virtual exclusion of other aspects of cycling. Then there’s the pro peloton, where there’s now incredible segregation between sprinters and everyone else. That translates to amateur riders classifying themselves in similar ways. Unless you fancy yourself a sprinter, the thinking goes, you’re better off training your Lactate Threshold and VO2 Max and not worrying about your sprint. And finally there’s the fact that time-crunched athletes have to prioritize their efforts and spend time training the aspects of cycling that will make them most successful. That means – and the programs in “The Time-Crunched Cyclist” are examples of this – focusing on LT and VO2 max intervals. Solo efforts are often the most effective. Why Include Sprint Workouts in Your Training? The short answer is that there’s no downside to being quicker, you can see improvements without adding a lot of extra work to your training program, and sprinting may enhance the aerobic and lactate threshold training you’re already doing. Way back when I was racing, Noel Dejonckheere – a Belgian sprinter and winner of four stages of the Vuelta in the 1970s – gave me some advice that stuck with me. He said that even for all-rounders and domestiques like me, practicing sprints once a week during an endurance ride would get me half a wheel in a sprint. Some of the benefit was from increased explosive power, but those sprints also improved my reaction time for accelerations in the peloton to bridge small gaps and go with attacks. When you practice sprinting you’re practicing accelerations, and that has applications far beyond the final surge to the finish line. There’s also evidence that sprint workouts stimulate some of the same physiological adaptations as longer workouts. A 2008 study by Burgomaster compared the impact of 3 weekly workouts of 6×30-second sprints over the course of 6 weeks, with five weekly 60-minutes rides at 65% of VO2 max, which was 225kJ vs 2250kJ of weekly work. The study confirmed the results other researchers (Gibala, 2006; Talanian, 2007, and others) that even short sprints elicited improvements in carbohydrate and fat oxidation in muscle cells, similar to the improvements seen with traditional endurance training. For non-sprint specialists, there are two main components to building a solid sprint: explosive power and top-end speed. Fortunately, the workouts for both are simple to execute and can be easily incorporated into an endurance ride. To develop explosive power you need to accelerate against resistance, which means starting out going slow in a big gear and powering that gear up to high speed. PowerStarts are something I sometimes do while commuting to work on an empty bike path. You slow down to almost a complete stop in a very big gear (53×12-14 or 50×11-13) and with your hands in the drops and starting with your dominant foot at about 1-2 o’clock position, you jump out of the saddle and accelerate that gear as rapidly as you can for 20 seconds or until you’re spun out, whichever comes first. I like to take about 5 minutes between PowerStarts and I’d recommend doing 5-8 of them in a single session. After the initial acceleration, you have to have good top-end speed to be able to get to the finish line first. 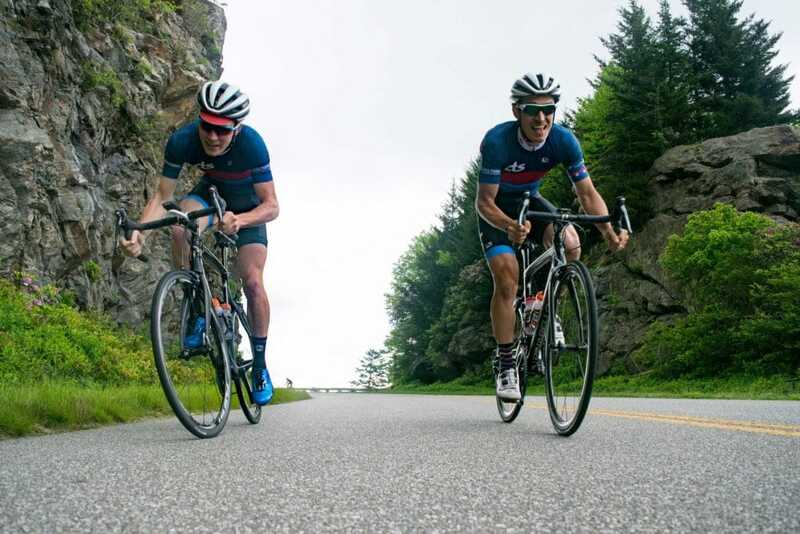 Since in the group ride or a race you’ll be sprinting from a higher speed than your normal training ride, you need to practice sprints from a fast-starting speed. Downhill HighSpeedSprints accomplish this goal and give you the feedback you need for controlling the bike in a high-speed sprint. Ideally, start a 30-second sprint while you’re about 15 seconds from the bottom of a hill so that you’re sprinting as the road transitions to flats ground or even starts going back uphill. Like the PowerStarts, take at least 5 minutes recovery between efforts and incorporate 5-8 into a ride. The last workout I’d recommend targets the ability to accelerate more than once in a sprint. To be successful in a finishing sprint, bridging a gap, or establishing a breakaway, you often have to accelerate, settle in at high speed, and then accelerate again. I recommend a variation of SpeedIntervals, a set of four 30-second accelerations separated by 30 seconds of easy spinning recovery (4x30sec/30sec). In essence, you’ll accelerate, spin down, and then accelerate again before you catch your breath or lose all the momentum from your previous acceleration. Take 5 minutes of normal endurance riding between sets and complete 4-5 sets during an endurance ride. Burgomaster KA, Howarth KR, Phillips SM, Rakobowchuk M, MacDonald MJ, McGee SL, Gibala MJ (2008). Similar metabolic adaptations during exercise after low volume sprint interval and traditional endurance training in humans. J Physiol 586.1, 151–160. Gibala MJ, Little PJ, van Essan M, Wilkin GP, Burgomaster KA, Safdar A, Raha S & Tarnopolsky MA (2006). Short-term sprint interval versus traditional endurance training: similar initial adaptations in human skeletal muscle and exercise performance. J Physiol 575, 901–911. Talanian JL, Galloway SD, Heigenhauser GJ, Bonen A & Spriet LL (2007). Two weeks of high-intensity aerobic interval training increases the capacity for fat oxidation during exercise in women. J Appl Physiol 102, 1439–1447.